Kilchberg, 18 August 2015 – With above-average sales growth of 17.4%, up to CHF 1.409 billion, the Lindt & Sprüngli Group is building on its impressive track record of recent years, despite record-high prices for raw materials and a strong Swiss franc. In local currencies, the Group’s sales growth increased by 24.9%. Without the first-time consolidation of Russell Stover, Lindt & Sprüngli achieved organic sales growth of 9.4%. This solid growth is being driven mainly by the core European markets, North America, the emerging markets and the company’s own worldwide store network Global Retail. Market share gains were achieved in all strategically important markets. Lindt & Sprüngli is extending its already strong leading position in North America with the integration of the US chocolate company Russell Stover, acquired last year. 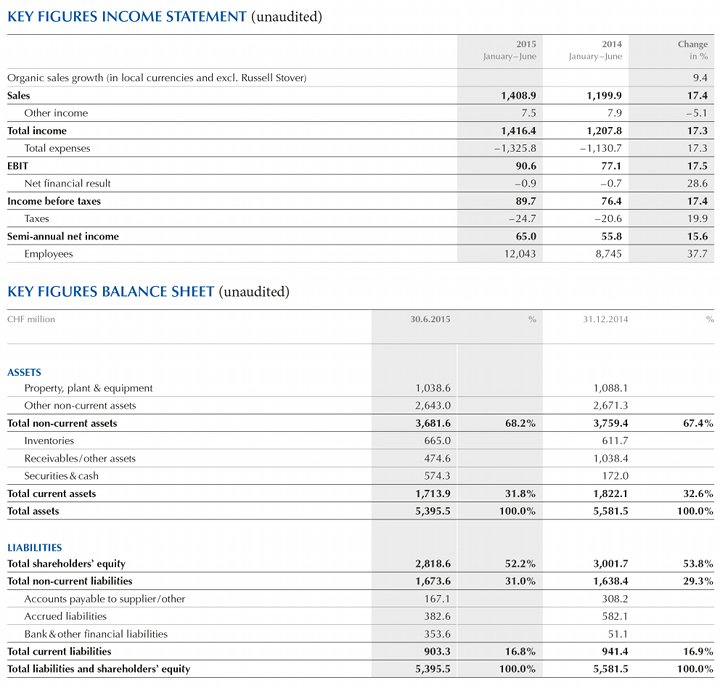 Net income (EBIT) at the end of June 2015 was 17.5% higher than the same period in 2014, at CHF 90.6 million. The company’s very impressive results and its ongoing success confirm that Lindt & Sprüngli continues to be one of the most successful premium chocolate companies in the world. Record-high prices for cocoa beans, hazelnuts and almonds, as well as the persistently strong Swiss franc, are creating challenges for Lindt & Sprüngli also. Given the particular nature of these challenges, the company’s long-standing and successful business model is paying off well. Uncompromising commitment to the highest quality, constant innovation, a clear market positioning in the premium chocolate segment and steady investment in both the brand and new technologies are the basis for the strategy, providing a solid platform for the Group’s continuing growth. Lindt & Sprüngli achieved organic growth in all regions – “Europe”, “NAFTA” and “Rest of the World” – and has once again won additional market share in all strategically important markets. Organic growth in the Europe segment reached +6.9%, despite the fact that key markets for chocolate like Switzerland and Europe are largely saturated and facing extremely difficult market conditions. In a flat Swiss chocolate market, Lindt & Sprüngli achieved good results. LINDT continues to realize sales growth in Italy through its expanding modern retail channels. In Germany and France, the increase in LINDT sales was well above the market average, even reaching double digits in the UK. In the “NAFTA” segment (excluding Russell Stover), Lindt & Sprüngli achieved sales of CHF 370.1 million, equivalent to strong organic growth of +10.3%. The double-digit growth achieved in North America was strengthened by the contribution from the prestigious US chocolate manufacturer Russell Stover, which was consolidated in the Group for the first time. In the first half of the year, the NAFTA region (including Russell Stover) increased its sales by +69.2% to CHF 544.9 million. The integration is well on track and the business is progressing in line with our ambitious targets. Lindt & Sprüngli thus continues to significantly outperform the chocolate market as a whole and expand the strong position it already occupies in the premium-chocolate segment in North America, the world’s biggest chocolate market. Sales in the “Rest of the World” segment increased by +18.2% to CHF 181.1 million. The positive performance was driven by double-digit growth rates, especially in Australia, but progress in the developing markets Japan, South Africa, Russia and Brazil has been very positive as well. This is partly attributable to the consistently strong growth rates achieved by Lindt & Sprüngli’s Global Retail Division, which continues to extend the worldwide store network at selected prime locations. It is a crucial component of the company’s future-oriented expansion strategy. The home market of Switzerland also supported this trend during the reporting period. Lindt & Sprüngli opened a new LINDT shop at an exclusive location in Zermatt – just in time for the celebrations marking the 150th anniversary of the first Matterhorn ascent. Our shop offers a breathtaking view of the Matterhorn, one of Switzerland’s most iconic and frequently photographed tourist attractions. Despite the strong Swiss franc, Lindt & Sprüngli remains firmly committed to Switzerland as a business base. With the Group’s global headquarters and the chocolate factory in Kilchberg, as well as the cocoa processing center in Olten and the logistic hub in Altendorf, Lindt & Sprüngli is strongly committed to Switzerland as a place to do business. Today, Lindt & Sprüngli is the biggest employer on the left shore of Lake Zurich. The company will continue to make ongoing investments in locations in its home market. From its Swiss base, it exports LINDT products to more than 120 countries. In the first half of 2015, the Lindt & Sprüngli Group achieved consolidated sales of CHF 1.409 billion. This equates to sales growth in Swiss francs of 17.4% (in local currencies 24.9%). Excluding Russell Stover, organic sales growth was 9.4%. The currency effect on Group sales caused by the stronger Swiss franc was -7.5%. Net income (EBIT) at the end of June 2015 was 17.5 % higher than the same period in 2014, at CHF 90.6 million. The currency translation effect caused by the stronger Swiss franc on EBIT level was -10.6%. After deduction of taxes, which were slightly higher at a rate of 27.5% due to the profit contribution from Russell Stover, the Group’s net income was CHF 65.0 million. This represents an increase of CHF 9.2 million, or 16.5%, compared with the prior-year period. Including the Russell Stover workforce, consolidated for the first time in the reporting period, the number of full-time employees worldwide compared with the prior year rose in the first half-year by 3,298 to a total of 12,043. Because of increasing volumes, new jobs are being created mainly in the production sector and in Lindt & Sprüngli’s own retail store sector. Outlook: For the year 2015 as a whole, Lindt & Sprüngli confirms the existing medium to long-term strategic sales growth forecast, in local currency terms, of 6% to 8%. The integration of Russell Stover in the USA is a top priority for the Group. Once this integration has been successfully completed, the EBIT margin is expected to increase by 20 to 40 basis points. About Lindt & Sprüngli: As global leader in the premium chocolate sector, Lindt & Sprüngli looks back on a long-standing tradition of 170 years with its origins in Zurich, Switzerland. Today, quality chocolate products by Lindt & Sprüngli are made at 12 own production sites in Europe (key brands: LINDT, CAFFAREL, HOFBAUER) and the USA (key brands: LINDT, GHIRARDELLI, RUSSELL STOVER, WHITMAN’S). They are distributed by numerous subsidiary companies and branch offices, and also via a comprehensive network of independent distributors all over the world. With over 12,000 employees, the Lindt & Sprüngli Group reported sales worth CHF 3.39 billion in 2014. When interpreting first half-year results, it must be borne in mind that the Lindt & Sprüngli Group is active in the seasonal, gift-oriented premium-chocolate segment, where less than 40% of total annual sales are achieved in the first half of the year. However, these figures must be set against the fact that about one half of the fixed production, administration and marketing costs have already been booked at the end of June. Thus, in the first half-year, profitability in relation to sales is generally well below the figures stated for the year as a whole. www.lindt-spruengli.com (Investors – Financial Information). Some of the statements expressed in the semi-annual report are based on forward-looking assumptions. That actual results may vary from these for a variety of reasons, including factors such as general economic conditions, fluctuations within the currency and raw materials sector, and changes to the regulatory landscape. Forward-looking statements made in this report are neither updated nor revised. The semi-annual report is published in German and English, with the German version being binding.